WE ARE HAPPY TO WELCOME YOU TO OUR LADY OF GUADALUPE PRAYER GARDEN. SINCE OUR FOUNDING IN WINDSOR IN THE EARLY 1970S AS A MISSION, IT HAS BEEN OUR DREAM TO HAVE A PRAYER GARDEN, AND NOW THAT DREAM HAS BEEN REALIZED. 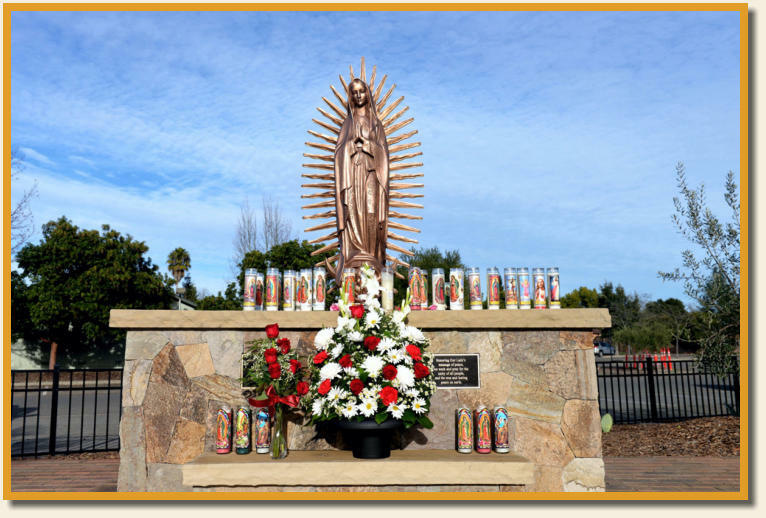 • Our Lady of Guadalupe Prayer Garden is intended to provide a welcoming place for people to pray or meditate when the church is not available. • The Prayer Garden belongs to our entire parish family. We are a community of God’s children. A significant goal of the Prayer Garden is to facilitate a sense of community where everyone’s participation is of equal importance. • The theme of the Prayer Garden is Peace and Hope, and it is open to everyone. • The Prayer Garden is located just outside the church building on the side of the building adjacent to Alden Lane. We invite you to use this website to explore our Prayer Garden and the process that made it a reality. And, while we may refer to it as “our” Prayer Garden, we want you to think of it as “your” Prayer Garden too. Whether you are a member of our parish, a local resident, or a visitor from far away, we hope you will visit the Prayer Garden and experience the Peace and Hope that are its themes.